For other uses, see Iphigenia (disambiguation). In Greek mythology, Iphigenia (/ɪfɪdʒɪˈnaɪ.ə/; Ancient Greek: Ἰφιγένεια, [iː.pʰi.ɡé.neː.a] Iphigéneia) was a daughter of King Agamemnon and Queen Clytemnestra, and thus a princess of Mycenae. In the story, Agamemnon offends the goddess Artemis on his way to the Trojan War. She retaliates by preventing the Greek troops from reaching Troy unless Agamemnon kills Iphigenia at Aulis as a human sacrifice. In some versions, Iphigenia dies at Aulis, but in others, Artemis rescues her. In the version where she is saved, she goes to the Taurians and meets her brother Orestes. "Iphigenia" means "strong-born," "born to strength," or "she who causes the birth of strong offspring." Iphianassa (Ἰφιάνασσα) is the name of one of Agamemnon's three daughters in Homer's Iliad (ix.145, 287) The name Iphianassa may be simply an older variant of the name Iphigenia. "Not all poets took Iphigenia and Iphianassa to be two names for the same heroine," Kerenyi remarks, "though it is certain that to begin with they served indifferently to address the same divine being, who had not belonged from all time to the family of Agamemnon." In Greek mythology, Iphigenia appears as the Greek fleet gathers in Aulis to prepare for war against Troy. At Aulis, the leader of the Greeks, Agamemnon, accidentally kills a deer in a grove sacred to the goddess Artemis. She punishes him by interfering with the winds so that his fleet cannot sail to Troy. The seer Calchas reveals that, to appease Artemis, Agamemnon must sacrifice his eldest daughter, Iphigenia. Agamemnon at first refuses but, pressured by the other commanders, eventually agrees. Iphigenia and her mother Clytemnestra are brought to Aulis under the pretext of a marriage to Achilles, but soon discover the marriage is a ruse. In some versions of the story, Iphigenia remains unaware of her imminent sacrifice until the last moment, believing that she is led to the altar to be married. In some versions, Iphigenia is not actually sacrificed. According to Hyginus' Fabulae, Iphigenia was not sacrificed. Some sources claim that Iphigenia was taken by Artemis to Tauris in Crimea at the moment of the sacrifice, and that the goddess left a deer or a goat (the god Pan transformed) in her place. The Hesiodic Catalogue of Women called her Iphimede (Ἰφιμέδη) and told that Artemis transformed her into the goddess Hecate. Antoninus Liberalis said that Iphigenia was transported to the island of Leuke, where she was wedded to immortalized Achilles under the name Orsilochia. In Aeschylus's Agamemnon, the first play in the Oresteia, the sacrifice of Iphigenia is given as one of the reasons that Clytemnestra and her lover Aegisthus plan to murder Agamemnon. In Euripides’ Iphigenia at Aulis, it is Menelaus who convinces Agamemnon to heed the seer Calchas's advice. After Agamemnon sends a message to Clytemnestra informing her of Iphigenia's supposed marriage, he immediately regrets his decision and tries to send another letter telling them not to come. Menelaus intercepts the letter and he and Agamemnon argue. Menelaus insists that it is Agamemnon's duty to do all he can to aid the Greeks. Clytemnestra arrives at Aulis with Iphigenia and the infant Orestes. Agamemnon tries to convince Clytemnestra to go back to Argos, but Clytemnestra insists on staying for the wedding. When she sees Achilles, Clytemnestra mentions the marriage; Achilles, however, appears to be unaware of it, and she and Iphigenia gradually learn the truth. Achilles, angry that Agamemnon has used him in his plot, vows to help prevent the murder of Iphigenia. Iphigenia and Clytemnestra plead with Agamemnon to spare his daughter's life. Achilles informs them that the Greek army, eager for war, has learned of the seer's advice and now demand that Iphigenia be sacrificed. If Agamemnon refuses, it is likely they will turn on him and kill him and his family. Iphigenia, knowing she is doomed, decides to be sacrificed willingly, reasoning that as a mere mortal, she cannot go against the will of a goddess. She also believes that her death will be heroic, as it is for the good of all Greeks. Iphigenia exits, and the sacrifice takes place offstage. Later, Clytemnestra is told of her daughter's purported death—and how at the last moment, the gods spared Iphigenia and whisked her away, replacing her with a deer. Euripides’ other play about Iphigenia, Iphigenia in Tauris, takes place after the sacrifice, and after Orestes has killed Clytemnestra and Aegisthus. Apollo orders Orestes—to escape persecution by the Erinyes for killing his mother, Clytemnestra, and her lover—to go to Tauris. While in Tauris, Orestes is to carry off the xoanon (carved wooden cult image) of Artemis, which had fallen from heaven, and bring it to Athens. When Orestes arrives at Tauris with Pylades, son of Strophius and intimate friend of Orestes, the pair are immediately captured by the Tauri, who have a custom of sacrificing all Greek strangers to Artemis. Iphigenia is the priestess of Artemis, and it is her duty to perform the sacrifice. Iphigenia and Orestes don’t recognize each other (Iphigenia thinks her brother is dead—a key point). Iphigenia finds out from Orestes, who is still concealing his identity, that Orestes is alive. Iphigenia then offers to release Orestes if he will carry home a letter from her to Greece. Orestes refuses to go, but bids Pylades to take the letter while Orestes will stay to be slain. After a conflict of mutual affection, Pylades at last yields, but the letter makes brother and sister recognize each other, and all three escape together, carrying with them the image of Artemis. After they return to Greece—having been saved from dangers by Athena along the way—Athena orders Orestes to take the Xoanon to the town of Halae, where he is to build a temple for Artemis Tauropolos. At the annual festival held there in honor of Artemis, a single drop of blood must be drawn from the throat of a man to commemorate Orestes's near-sacrifice. Athena sends Iphigenia to the sanctuary of Artemis at Brauron where she is to be the priestess until she dies. According to the Spartans, however, they carried the image of Artemis to Laconia, where the goddess was worshipped as Artemis Orthia. These close identifications of Iphigenia with Artemis encourage some scholars to believe that she was originally a hunting goddess whose cult was subsumed by the Olympian Artemis. Orestes and Iphigéneia stealing the statue of Diana Taurique. The people of Tauris/Taurica facing the Euxine Sea worshipped the maiden goddess Artemis. Some very early Greek sources in the Epic Cycle affirmed that Artemis rescued Iphigenia from the human sacrifice her father was about to perform, for instance in the lost epic Cypria, which survives in a summary by Proclus: "Artemis ... snatched her away and transported her to the Tauroi, making her immortal, and put a stag in place of the girl [Iphigenia] upon the altar." The goddess swept the young princess off to Tauris where she became a priestess at the Temple of Artemis. The earliest known accounts of the purported death of Iphigenia are included in Euripides' Iphigenia at Aulis and Iphigenia in Tauris, both Athenian tragedies of the fifth century BC set in the Heroic Age. In the dramatist's version, the Taurians worshipped both Artemis and Iphigenia in the Temple of Artemis at Tauris. Other variants include her being rescued at her sacrifice by Artemis and transformed into the goddess Hecate. Another example includes Iphigenia's brother, Orestes, discovering her identity and helping him steal an image of Artemis. Possible reasons for key discrepancies in the telling of the myth by playwrights such as Euripides are to make the story more palatable for audiences and to allow sequels using the same characters. The myth was retold in classical Greece and Italy, but it became most popular in Etruria, especially in Perusia. In the second and first centuries BC the Etruscans adorned their cremation-urns with scenes from the sacrifice. The most common scene: "Iphigenia, a little girl, is held over the altar by Odysseus while Agamemnon performs the aparchai. Clytemnestra stands beside Agamemnon and Achilles beside Odysseus and each one begs for the life of Iphigenia." This version is closest to the myth as the Romans told it. 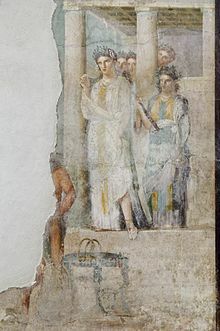 Iphigenia at Aulis, play by Euripides. Iphigénie en Aulide, play by Jean Racine. Iphigénie en Aulide, opera by Christoph Willibald Gluck. Iphigenia, film by Michael Cacoyannis. The Songs of the Kings, novel by Barry Unsworth. Iphigenia, play by Mircea Eliade. Iphigenia at Aulis, the first part of The Greeks trilogy, adapted and directed by John Barton for the Royal Shakespeare Company in 1980. Iph. . ., adapted by Colin Teevan. Iphigenia in Tauris, play by Euripides. Iphigénie en Tauride, opera by Henri Desmarets and André Campra. Ifigenia in Tauride, opera by Tommaso Traetta. 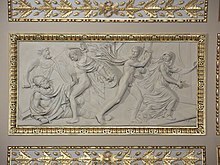 Iphigenie auf Tauris, play by Johann Wolfgang von Goethe. Iphigénie en Tauride, opera by Christoph Willibald Gluck. Iphigenia in Brooklyn, a solo cantata by Peter Schickele under the guise of P. D. Q. Bach. Iphigénie, ballet by Charles le Picq. Iphigenia, play by Samuel Coster. Iphigenia in Orem, part of Bash: Latter-Day Plays, a collection of three plays by Neil LaBute. A Memory of Wind, story by Rachel Swirsky. Agamemnon's Daughter, novel by Ismail Kadare. The Atlantic speculates that Shireen Baratheon, a young girl from the TV series Game of Thrones who was sacrificed to a God by her father, was based on Iphigenia. Slate similarly writes: "Every beat of the Greek myth is the same as Stannis's story: The troops are stuck and starving and the general, Agamemnon, must sacrifice his own daughter to turn the fates to their favor. The mother begging for mercy, the disapproving second-in-command who can do nothing to stop it, the daughter who says she will do whatever it takes to help—it's all a clear echo." In Sacrifice, the second volume of Eric Shanower's Age of Bronze comic book series, the substitution of a deer for Iphigenia is a pious lie invented by Odysseus to comfort the grieving Clytemnestra. However, it does not work and Clytemnestra angrily curses the whole Achaean army, wishing they all die in the war. Sheri S. Tepper's The Gate to Women's Country contains a similar idea, with a play named Iphigenia at Ilium running through the novel as a leitmotif. Within the novel, the ghost of Iphigenia tells Achilles that all the poets lied. Iphigenia says that she did not die willingly, nor was a hind sent to take her place. Iphigenia also realizes that these myths no longer have any power over her. Achilles then attempts to claim her as his wife, but she reminds him that "women are no good to you dead". There is also speculation that Iphigenia was actually the daughter of Helen and Theseus. In Madeline Miller's The Song of Achilles, Iphigenia comes to Aulis under the belief that she is to marry Achilles. Instead, she is unwillingly sacrificed to appease Artemis. The full (rarely used) name of the fictional private investigator V. I. Warshawski, created by Sara Paretsky, is Victoria Iphigenia Warshawski. In the 1985 novel Killing Orders, third in the series, the protagonist identifies herself with the character of Greek myth, and recognizes the similarity of a traumatic event of her childhood with the act of Iphigenia's sacrifice. In Yorgos Lanthimos' The Killing of a Sacred Deer, the myth of Iphigenia is given a modern retelling. ^ Henry George Liddell and Robert Scott, A Greek-English Lexicon, s.v. "Iphigenia" and Rush Rehm, The Play of Space (2002, 188). Karl Kerenyi, aware of Iphigenia's obscure pre-history as an autonomous goddess rather than a mere marriageable girl in the house of Agamemnon, renders her name "she who governs births mightily" (Kerenyi 1959:331). ^ The three are Chrysothemis, Laodice (the double of Electra) and Iphianassa. In Iliad ix, the embassy to Achilles is empowered to offer him one of Agamemnon's three daughters, implying that Iphianassa/Iphigenia is still living, as Friedrich Solmsen 1981:353 points out. ^ Kerenyi 1959:331, noting Sophocles, Elektra 157. Kerenyi clearly distinguishes between parallel accounts of Iphigenia. "It is possible in the Cypria Agamemnon was given four daughters, Iphigenia being distinguished from Iphianassa," Friedrich Solmsen remarks, (Solmsen 1981:353 note 1) also noting the scholium on Elektra 157. ^ a b Siegel, Herbert (1981). "Agamemnon in Euripides' "Iphigenia at Aulis"". Hermes. 109: 257–65. JSTOR 4476212. ^ a b "Mortal women of the Trojan War: Iphigenia". Stanford University. Archived from the original on July 15, 2014. ^ Pseudo-Apollodorus, Epitome of the Library 3.21. ^ This fragmentary passage (fr. 23(a)17–26), found among the Oxyrhynchus Papyri, has been restored to its proper place in the Ehoeae, the Hesiodic Catalogue, in modern times; the awkward insertion of eidolon—the image of Iphimede—and lines where Artemis saves her are considered a later interpolation by Friedrich Solmsen, "The Sacrifice of Agamemnon's Daughter in Hesiod's' Ehoeae" The American Journal of Philology 102.4 (Winter 1981), pp. 353–58. ^ this doesn't appear in any of the surviving passages of the Hesiodic catalogue but is attested for it by Pausanias, 1.43.1. ^ Tauris is now the Crimea. ^ J. Donald Hughes, "Goddess of Conservation." Forest and Conservation History 34.4 (1990): 191–97. ^ Taurica (Greek: Ταυρίς, Ταυρίδα, Latin: Taurica) also known as the Tauric Chersonese and Chersonesus Taurica, was the name of Crimea in Antiquity. ^ Robert Graves, The Greek Myths, London: Penguin, 1955; Baltimore: Penguin pp. 73–75: "Iphigenia Among the Taurians"
^ Pilo, Chiara; Giuman, Marco (2015). "Greek Myth on Etruscan Urns from Perusia: the sacrifice of Iphigenia". Etruscan Studies. 18.2: 97–125. ^ Mee, Charles L. "Iphigenia 2.0". Retrieved December 9, 2012. ^ "Metamorphoses". Retrieved June 25, 2015. ^ "554. Iphigeneia. Walter Savage Landor. 1909–14. English Poetry II: From Collins to Fitzgerald. The Harvard Classics". ^ Kornhaber, Spencer. "The Most Disturbing Thing About the Shireen Scene on 'Game of Thrones'". ^ Marcotte, Amanda (9 June 2015). "Don't Be So Shocked by the Deaths on Game of Thrones: The Show Is a Classical Tragedy" – via Slate. ^ Shanower, Eric (2004). Age of Bronze: Sacrifice. Berkeley, California: Image Comics. ISBN 1-58240-399-6. ^ Antoninus Liberalis, Metamorphoses 27 (online text) Iphigenia is called a daughter of Theseus and Helen, raised by Clytemnestra. Evans, Bergen (1970). Dictionary of Mythology. New York: Dell Publishing. ISBN 0-440-20848-3. Wikimedia Commons has media related to Iphigeneia. Wikisource has the text of the 1920 Encyclopedia Americana article Iphigenia. This page was last edited on 16 April 2019, at 18:38 (UTC).